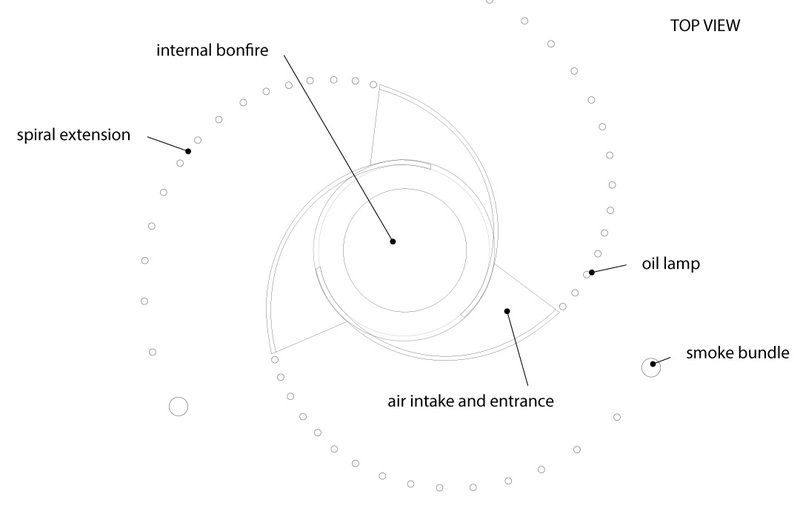 Following on from my first effigy in 2012 and the 2014 temple that both produced fire vortexes, I am proposing building a seven metre high turbine to produce a giant fire tornado. This will be a circular structure created with three large spiral air intakes. The center will contain a large bonfire that will create a vacuum and pull the air in via the spiral inlets. This will cause the air to spin within the chamber and then continue to spin up the cylinder barrel. The top of the barrel will also be packed with wood (as a lattice to maintain airflow), making the fire more intense and higher as the flames spiral from the top of the barrel to burn the humanoid effigies above. The spiral formation has a long symbolic history and is probably the oldest known symbol of human spirituality. It symbolises the journey and the source of life, our DNA. The spiral also connects us to the natural world reflecting one of natures most aesthetically and mathematically beautiful forms. Lamps made from bamboo, food tins, wick and volatile oil create flame for the outer arms of the spiral. These lamps will also provide structure to attach the canvas wall. On each tip so the spiral arms will be a bundle similar to a giant smudge stick or incense cone that will produce thick smoke and perfume. The smoke will add visual effect to the bottom edges of the installation as well as having a cleansing function similar to an indigenous smoking ceremony or pagan smudging. The perfume (maybe from local trees) will add another dimension of smell to the performance. This idea has not been incorporated into the current artwork. Creating a wooden bellow mechanism in each of the three inlets to increase the intensity of the central furnace and the height of the fire devil. These would be operated via ropes, allowing the participants to be a safe distance away. 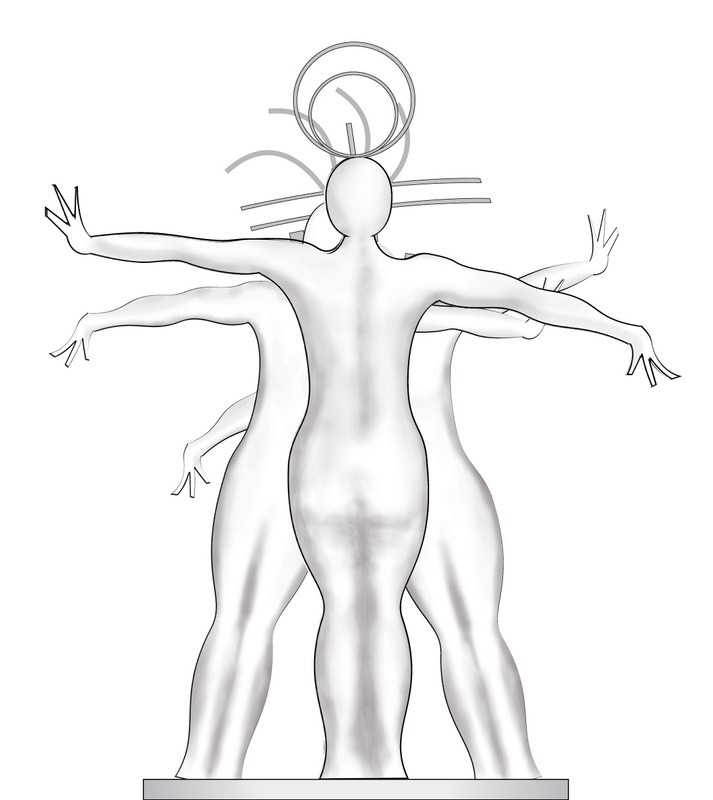 The three androgynous effigies symbolise our burner community coming together to share and to be as one. Constructed with a frame of solid wood and large bamboo. This structure will then be formed with smaller bamboo and large scale paper mache to allow fluid curves. This will allow it to burn in aesthetic stages. 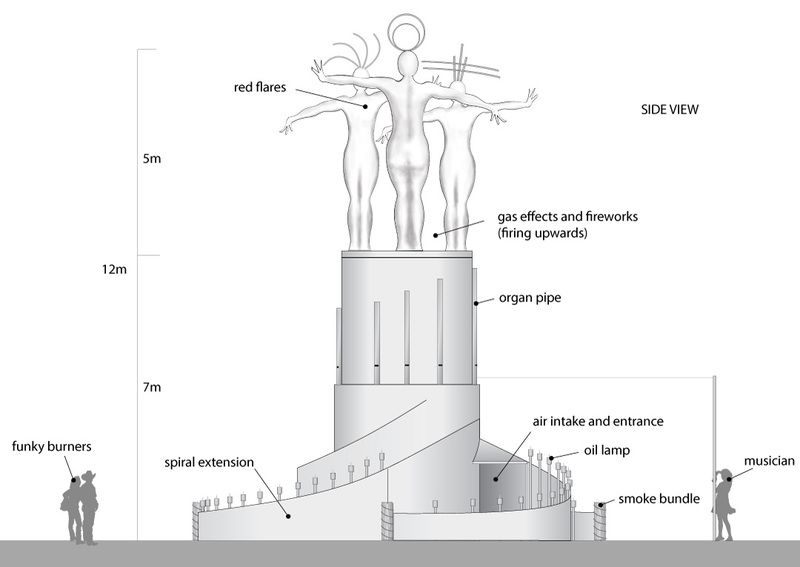 The fireworks and gas effects will be positioned in and around the centre of the effigies at the top of the turbine. This will be decorated with the theme of Red Lust. Hey we are at a festival after all. This will involve carpet, material draping, cushions, wall paintings and poetry, chandelier and lighting. On the outside of the turbine barrel will be multiple bamboo lengths constructed into large organ pipes connected to the upward air flow. The bamboo will be green so it withstands the fire as long as possible. This pipes will be remotely operated by ropes and lengths of bamboo. A number of musicians will improvise to play the instrument. 1. The outer spiral lamps will be lit by three people dressed as druids, starting from the outer smoke bundles through to the inner lamps. The druids move to a safe distance. 2. The gas effects and fireworks are deployed in the centre, raising within the space between the figures, showing the energy, creativity, excitement and wonder of the burning seed festival. 4. The three figures are released and they fall into each other to a loving embrace that is so intense fire raises from all their hearts, fuelling our temporary burning seed love affair. Red flares that are positioned in the effigies hearts are fired. This will cause them to glow bright red and catch fire, burning the top part of the paper mache structure, leaving the solid wood sculptures. 5. The bellows stoke the fire until it raises above the barrel, creating the fire vortex and begins to burn the effigies. 6. The musicians begin playing the instrument. 7. As it gains in intensity, the figures burn and fall. 8. The fire vortex continues to rise until the main turbine structure is engulfed in flames.